Look at the tasty details: the toppings are placed perfectly, just random enough to resemble the real mess of a pizza; the red bricks layered below the cheese make for a great sauce effect; the crust looks great with different shades of brown; and the dripping cheese was a great detail. 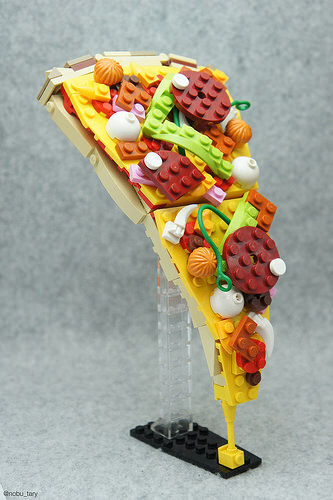 But most amazingly he built this piece in the most dynamic pose a slice of pizza can have, when you have just picked it up. Now I’m craving for a slice of delicious cheesy goodness even more.